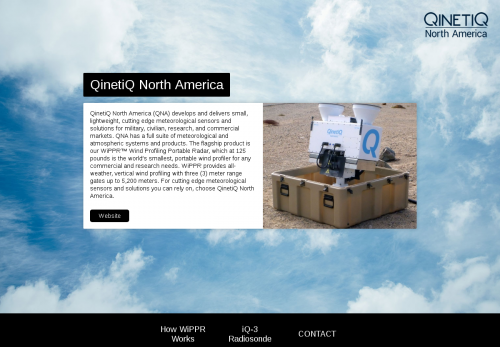 QinetiQ North America (QNA) develops and delivers small, lightweight, cutting edge meteorological sensors and solutions for military, civilian, research, and commercial markets. QNA has a full suite of meteorological and atmospheric systems and products. The flagship product is our WiPPR™ Wind Profiling Portable Radar, which at 125 pounds is the world’s smallest, portable wind profiler for any commercial and research needs. WiPPR provides all-weather, vertical wind profiling with three (3) meter range gates up to 5,200 meters. For cutting edge meteorological sensors and solutions you can rely on, choose QinetiQ North America. WiPPR accurately measures wind information on clear days as well as in inclement weather such as fog, rain and snow. Compared to other wind profiling technologies, WiPPR offers more accurate and reliable vertical wind measurements. The system is easy to use and features a high-resolution wideband RADAR that is capable of sensing horizontal and vertical wind speeds at altitudes up to 5 km with range bins as small as 3 meters. Compared to similar RADAR systems, WiPPR is considerably smaller, uses less power and requires minimal setup and maintenance. The new iQ-3 is a revolutionary synoptic radiosonde that measures real-time PTH and Winds Aloft information in support of synoptic military requirements and mission sets such as artillery fire support, tactical weather modeling, and high-altitude insertion/air drop. For the first time, military and research customers now have one station (TASK) capable of accepting both ultra-tactical and synoptic soundings—all while maintaining JPADS compatibility. The iQ-3 is launched with a balloon as small as 100 grams and filled with less than 20 cubic feet of helium/hydrogen. It uses significantly less helium/hydrogen compared to other systems— reducing the amount of gas carried by users. Please enter your name (required) and questions (optional) below and Varysian will enable communication with QinetiQ North America.